• The company is mum on its plans for developing the property. An aerial image of the joint Gordon County-Floyd County Northwest Industrial Park in Shannon. Members of the Gordon County-Floyd County Joint Development Authority approve a deal Wednesday to sell a joint industrial park in Shannon to Ball Packaging for between $1.6 million and $1.7 million. That works out to a total between $1.6 million and $1.7 million. The company has 120 days of due diligence to exercise its option to buy the entire park and then 30 days to close on the sale. Chris Grimsley, director of plant operations for Ball, said the company has no specific plans for the property at this time. "We're just looking for potential growth in the future. It's been a good 25 years in Rome and hopefully we will continue that down the road," Grimsley said. The company's operations northeast of Rome have been expanding. In 2016, the company received a $40 million bond package from the Rome-Floyd County Development Authority for an expansion of the primary canning plant off Hermitage Road. It also has warehouse space at the intersection of Burlington and Ga. 53 in the Shannon area. The large industrial park, known at one time as the Star Fields softball complex, was purchased in 1997 by the Gordon County-Floyd County Joint Development Authority at a time when the state was pushing multi-jurisdictional partnerships and offering special tax incentives for joint projects. "We are very pleased that Ball Corporation is expanding their presence in Northwest Georgia and we look forward to a long and beneficial relationship," said Larry Roye of Calhoun, chairman of the joint development authority in a press release. Floyd County Commission Chairman Scotty Hancock and Gordon County Commission Chairwoman Becky Hood both indicated their excitement with the sale. Hood said she was particularly happy that business enterprises continue to enjoy an extra $500 tax credit for each new full-time job created as permitted by the Joint Development Authority Act. The joint development authority, following action by both the Floyd and Gordon County commissions earlier in the week, approved an amendment to the intergovernmental agreement which will get the authority out of the land business. Floyd County will convey property that was not originally a part of the industrial park, but added to the total tract with SPLOST funds and will get back $107,368.77, the purchase price for the additional acreage. Floyd County will also be reimbursed $44,698 for legal fees that have been incurred by the authority through the years. Floyd County will also get back $6,250 for an official survey of the combined acreage and $27,200 paid for the property to be cleared a year or so ago. If for some reason, the sale is not consummated, Floyd County could ask that title to the property be reconveyed to the county. The original intergovernmental agreement also stipulated once the land was sold, the proceeds would be used to purchase additional property for a second industrial park site. The profits from the sale will be equally distributed to Floyd and Gordon County governments to be used in any such manner as is legally permitted. A small amount of money will be kept in reserve for the joint authority's ongoing operation. • Tiny House Hand Up Inc., which raises awareness surrounding affordable housing, will benefit from a concert featuring Rumours, a tribute band from Atlanta. Pictured are Haley Stephens (left), Ronnie York and Ernie Smith, of Battlefield Building Supply who donated the doors and windows for the tiny home project Stephens and York have been working on. Three years ago when Haley Stephens started feeding the homeless, he learned of alarming statistics regarding poverty rates in both Georgia and Gordon County. Soon after, he discovered affordable housing was a major contributing factor. Surprised by the shockingly high rates of poverty, Stephens and a few friends went about researching how to make housing more affordable, reading legal documents, housing requirements and getting involved with local governments. During his research, Stephens dug up the fact that in 2002, poverty rates increased from less than 10 percent in Gordon County to up to 30 percent and that Gordon County currently ranks 93rd in the state for poverty, which he found astonishing. The significance of 2002 was that during that year, housing regulations were changed from a minimum of 360 square feet to 800 square feet, which made housing more expensive and prevented lower-income families and individuals from building smaller homes. Stephens, along with others, saw a major problem in this requirement, especially with regards to people who can't afford to build their own houses, buy or even rent smaller homes. Hence, Tiny House Hand Up Inc. was born. The nonprofit is dedicated to promote awareness for affordable housing and encourage locals to pursue cheaper housing options. "We have a goal of raising $100,000 and building three tiny homes with that money," Stephens said. "One will be an example for people to see what a tiny house is and the other two will be for emergency purposes." Stephens, who serves as the chairman for the nonprofit, said they are in the middle of construction for their first tiny house, which is estimated to cost around $20,000. "There are a lot of misconceptions with tiny houses, especially when people see lavish, extravagant tiny homes on TV," Stephens said "There's some skepticism and the city and county governments had a couple of concerns, but when we started we had a petition signed by more than 500 people who were in support of us." And Stephens said Tiny House Hand Up Inc. is exactly what the name says, a "hand up," not a hand out, which he said is a common issue with nonprofits these days. The biggest thing he said that would help create affordable housing is if local governments would roll back the square footage requirement. Stephens, along with other officers of the organization, thinks that raising awareness can positively influence local officials to move in the right direction with regards to housing. And though Tiny House has raised $46,000 of their $100,000 goal, they are still a long way off, which is why they host fundraisers to raise the full amount of necessary funds for the three homes. Their next fundraiser, which will happen tonight, is a concert featuring a Fleetwood Mac tribute band called Rumours, which will be at the GEM Theatre at 8 p.m. Mekenzie Jackson, an Atlanta native who has the talent of impersonating Stevie Nicks' voice, will be bringing her band to Calhoun to sponsor the organization. Stephens and other members of the nonprofit will also be present, bringing along with them their first tiny house on a 28-foot trailer, which has yet to be officially completed. Those who attend the concert will be able to check in on construction progress, ask questions of the Tiny House Hand Up crew and enjoy the performance of Rumours. Funds from the concert will go directly to the completion of the first tiny home. Tickets can be purchased at the GEM Theatre box office or at calhoungemtheatre.org. Earlier this week, the Aquatic Center invited county and city firefighters to practice techniques for floating, one of many efforts of reaching out to the community. On Monday, firefighters from both the Calhoun and Gordon County Fire Departments were working on earning their diving certifications and practiced techniques to use should they accidentally fall into water while on the job. A young firefighter simulates accidentally falling into a body of water during training where Calhoun City and Gordon County firefighters were earning their diving certifications on Monday. One uniformed firefighter practices floating techniques while others act as support during Monday's diving certification training at the Calhoun Aquatic Center, where both city and county firefighters were training. A firefighter in uniform gets out of the pool following practicing floating techniques to be used should he ever fall into water while in the field. 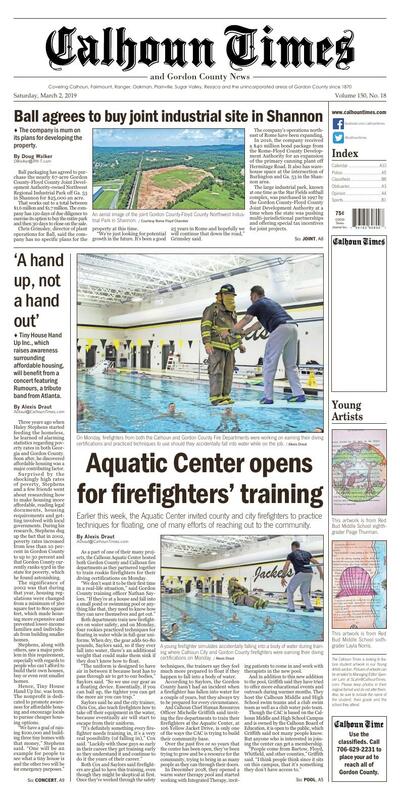 As a part of one of their many projects, the Calhoun Aquatic Center hosted both Gordon County and Calhoun fire departments as they partnered together to train rookie firefighters for their diving certifications on Monday. "We don't want it to be their first time in a real-life situation," said Gordon County training officer Nathan Saylors. "If they're at a house and fall into a small pond or swimming pool or anything like that, they need to know how they can save themselves and get out." Both departments train new firefighters on water safety, and on Monday, four rookies practiced techniques for floating in water while in full-gear uniforms. When dry, the gear adds 60-80 pounds, Saylors said, so if they ever fall into water, there's an additional weight that could make them sink if they don't know how to float. "The uniform is designed to have air in between it because heat has to pass through air to get to our bodies," Saylors said. "So we use our gear as a floating device. Essentially, if you can ball up, the tighter you can get the more air you can trap." Saylors said he and the city trainer, Chris Cox, also teach firefighters how to take off their equipment in the water, because eventually air will start to escape from their uniform. "It's definitely something every firefighter needs training in, it's a very real possibility (of falling in)," Cox said. "Luckily with these guys so early in their career they get training early so they understand it and continue to do it the years of their career." Both Cox and Saylors said firefighters are glad to have this training, even though they might be skeptical at first. Once they've worked through the safety techniques, the trainers say they feel much more prepared to float if they happen to fall into a body of water. According to Saylors, the Gordon County hasn't had an incident when a firefighter has fallen into water for a couple of years, but they always try to be prepared for every circumstance. And Calhoun Chief Human Resources Officer Michelle Griffith said inviting the fire departments to train their firefighters at the Aquatic Center, at 106 Yellow Jacket Drive, is only one of the ways the CAC is trying to build their community base. Over the past five or so years that the center has been open, they've been trying to grow and be a resource for the community, trying to bring in as many people as they can through their doors. In December 2018, they opened a warm water therapy pool and started working with Integrated Therapy, inviting patients to come in and work with therapists in the new pool. And in addition to this new addition to the pool, Griffith said they have tried to offer more educational events and outreach during warmer months. They host the Calhoun Middle and High School swim teams and a club swim team as well as a club water polo team. Though the CAC is based on the Calhoun Middle and High School Campus and is owned by the Calhoun Board of Education, it is open to the public, which Griffith said not many people know. But anyone who is interested in joining the center can get a membership. "People come from Bartow, Floyd, Whitfield, and other counties," Griffith said. "I think people think since it sits on this campus, that it's something they don't have access to." The facility also offers a daily adult swim class, swim lessons, lifeguard certification classes, summer youth programs and holiday-based events – including a St. Patrick's Day "Dive For Gold" and an Easter egg hunt in April. And to Griffith, one of the most important things as far as water safety goes is swimming lessons. Whether they're being offered for free, as a part of a summer camp or during school breaks, Griffith said lessons are crucial, especially for younger children. "One of the things we do most as far as helping people in the community is providing swim lessons," Griffith said. "They're one of the most invaluable things to offer for kids because water safety is a huge thing in our community." The CAC partners with city and county recreation centers and is working on bringing in other groups, camps and even a director to the facility. They try to add on a new aspect of the center each year, with their most recent addition being the warm water therapy pool. Griffith said on behalf of the staff that the CAC invites anyone who's interested to stop by and inquire more about the services offered. This artwork is from Red Bud Middle School eighth-grader Paige Thurman. This artwork is from Red Bud Middle School sixth-grader Layla Norris.